Free. No ads. No in-app purchases. Pure fun and science. Blues and Reds is not only a collection of fun and challenging puzzles but also a test of your skills. Our game measures how well you understand and solve competitive problems. When you complete all levels, we provide you with the analysis of your skills. The analysis indicates how well you perform with respect to other people. ​Below, we present an example of the analysis for Javier who identified as a 35-years old Argentinean male. The above results indicate the following. 1. Overall. Javier is among top 95% people in the whole world. 2. Age. * Javier is among top 97% of people from the whole world in age group 25 – 44 years. 3. Gender. Javier is among top 99% of all males from the whole world. ​4. Country. 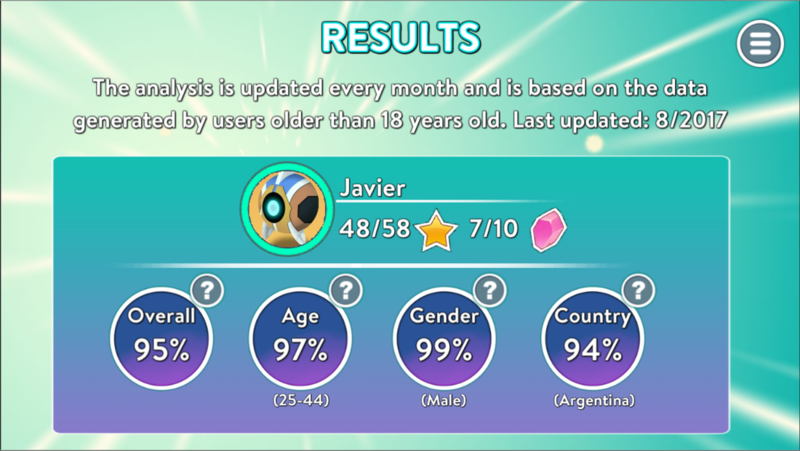 Javier is among top 94% of all people from Argentina. * There are four age groups: 18 – 24, 25 – 44, 45 – 64, and +65. While we do not impose age restrictions on who can play Blues and Reds, we do not knowingly use data from people younger than 18 years old. Nor do we knowingly collect their personal information; if we learn that we have inadvertently gathered personal data from people under 18 years of age, we will take reasonable measures to promptly delete such personal data from our records. Consequently, players younger than 18 years old are provided only with their "overall" rank.